The premiere Stomping Ground Ensemble comprised of Creative Team Members and instructors, they use true stories to help inspire improvised songs and scenes. Their improvised lyrics, harmonies, and larger-than-life characters are sure to give you a warm Texas welcome. Occasionally we have a special guest telling stories, so be sure to check social media to find out who our guest is for each show! 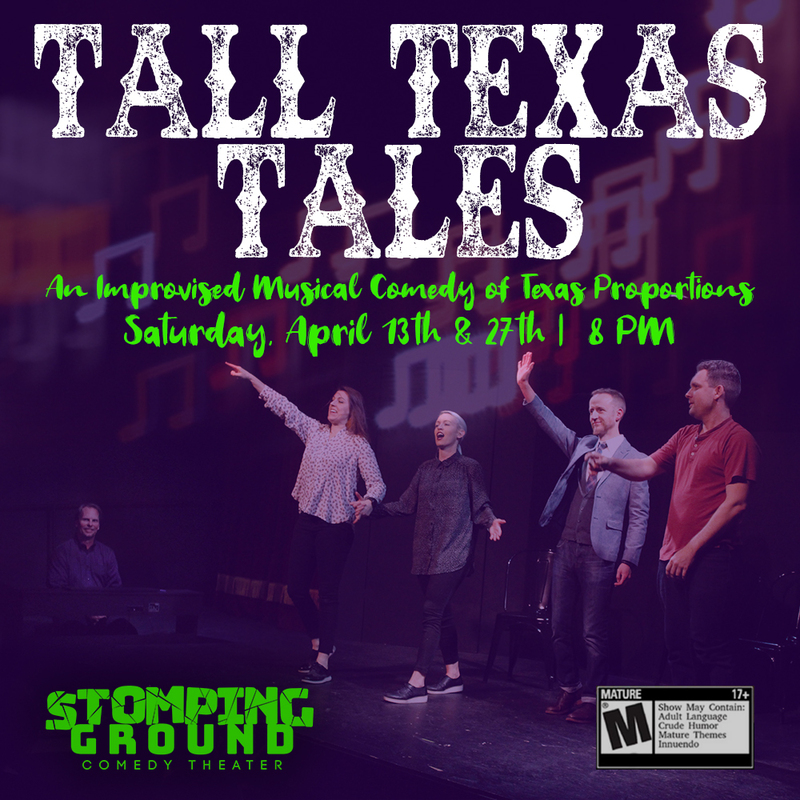 Tall Texas Tales is recommended for ages 18+. Seating starts 15 minutes prior to the show. Stomping Ground is BYOB. Ky Krebs is a stand-up comedian and show producer based out of Austin, TX. Krebs's sharp tongue and queer perspective delve into a surreal absurdity that manages to be both dark and playful. He is also one half of the hit comedy/self-help podcast Extra Salty with Jasmine Ellis that has featured guests such as Monroe Martin and Gina Yashere.He has been featured on several national comedy festivals including the 2018 Women in Comedy Festival sponsored by HBO, the Out of Bounds Comedy Festival in Austin in 2017 & 2018, the Dallas Comedy Festival, Altercation Comedy Festival in Austin, the Highlarious Comedy Festival in Seattle, the Midwest Queer Comedy Festival, and many more!The most common question Ky has received about his comedy from clubs and bookers is always the same: "Are all of your jokes gay jokes?" Arguably, every joke he's ever told is a gay joke since it's a gay person telling a joke. Even if they were all gay jokes, what's so scary about that? So, he's proving their not scary by doing an hour of them. 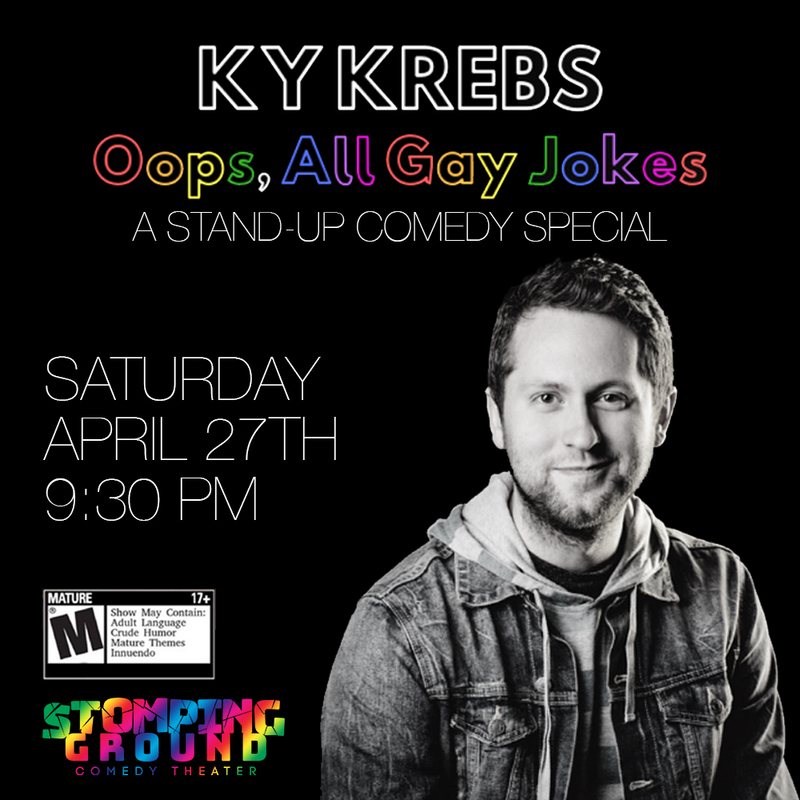 Join him for a one-night engagement at Stomping Ground Theater as he prepares for recording his first stand-up comedy special "Oops, All Gay Jokes". "...a Birbiglia-esque storyteller, and a masterful one" -TheaterJones"Krebs’s story is raw, inspiring, and he has plenty of experience to share about comedy, writing, and life in general." -ComedyWhamThis show is rated M for Mature/18+. Stomping Ground is BYOB. Seating begins 15 minutes prior to the start of the show.